About: Hey there! ^^ I'm just a crazy, fun-loving fruit loop in a world full of cheerios. 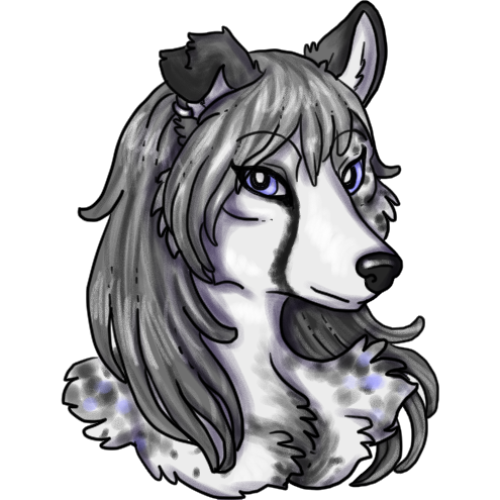 A woman of noble birth and bloodline, Karria is considered a being of the highest standard of genetics. Her jaw-dropping beauty is typically the first thing strangers will notice about her, quickly followed by her eloquence, intelligence,charisma and charm. She is an eye catcher for sure with the ideal, full, curvy, feminine figure with thick luxurious, dual layered fur and striking blue merle pattern markings peppered in three shades of darker gray through her otherwise light grey coat along her shoulders, haunches, tail and the left half of her face. 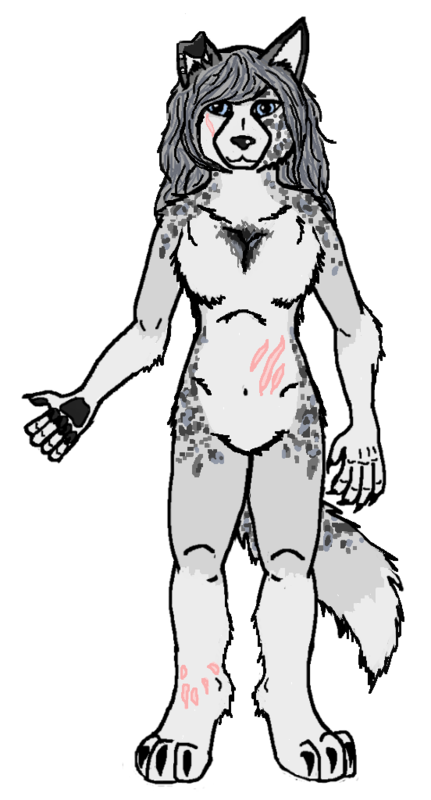 She has a single drooped ear-tip on the right (owed to her shepherd dog heritage) as well as long, feathered white fur along her limbs, undertail and chest. Four white sock-like markings adorn all four limbs and the same ivory tone dips her tail tip and colors her muzzle, cheeks and underside save for a small patch between her breasts which is the same dark gray as the merle markings. She remains well insulted and well groomed, always. Karria stands with regal elegance and moves gracefully, almost fluidly. She speaks in a manner that captivates her audience. Her hair is long and wavy, a silvery-blue gray in color and usually worn loose, and down along her back and shoulders, right-parted, or up in a high ponytail or back in french braid. Her eyes are a gorgeous icy, sky blue. She speaks with a light British accent. She has gained a thin scar along her right cheek as well as three slashes to her lower left abdomen. Marks from a bear trap marr her right ankle. 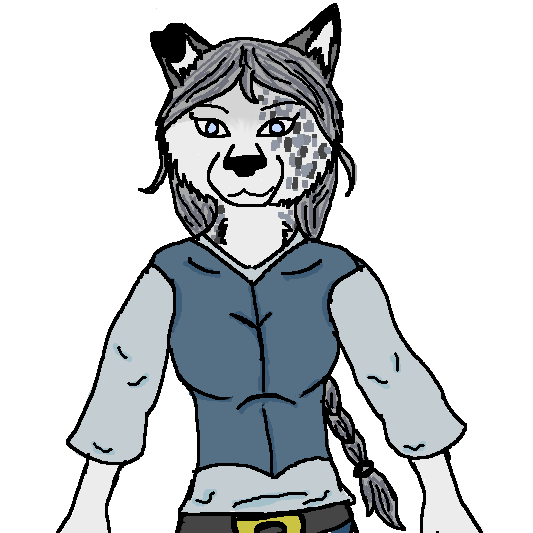 *Light blue-gray dyed, custom made, worn leather outfit with minor fur accents consisting of a cotton tunic, jerkin vest with tie up front, bracers, leather paneled skirt bottoms, light fabric cut off briefs, grieves and a light traveling cloak. *Two silver studs piercing her right, drooped ear. *A small simplistic, white-ink, arrow tattooed upon the side of her right, middle finger. *Dyed blue leather quiver with set of hand-fletched arrows and a bleached oak wood bow with carved feathers upon the tips. *A storage pack with basic survival gear and pouches for carrying goods. *Small wooden keepsake box with various precious gems and an item or two of jewelry of personal significance. Overall: Adventurous, amiable, articulate, captivating, charismatic, cultured, inquisitive, dedicated, dutiful, eloquent, elegant, freethinking, hardworking, honorable, modest, observant, eager, respectful, soft-spoken, gentle, kind, assertive, provocative, alluring. The Good: Adaptable, compassionate, courteous, loyal, empathetic, generous, honest, innovative, intuitive, playful, motherly, protective, resourceful, responsible, romantic, tolerant, trustworthy, witty, obedient. The Bad: Impatient, manipulative, spoiled, perfectionist, ambitious, competitive, emotional, mildly narcissistic, gullible, reserved, stoic, stubborn, aloof, somewhat arrogant, cocky, demanding, critical, nosy, petty, presumptuous. Biography: *Born into nobility in an area of the UK wilderness ruled by packs based off similar hierarchy as medieval feudal systems using old castles, estates and abandoned villages and historical keeps as pack bases. Raised as a noblewoman and the pride and joy (akin to the "Princess") of the pack. *Spoiled with riches and custom, one of a kind possessions. Held to high expectations and discipline. *Educated from an early age, trained in skills of choice (she chose healing and archery) as well as diplomacy in hopes for her to one day rule and lead as Alphess. She excelled in archery. Was best in her pack, better than most males. She put her everything into this skill when the life of a noble became too stressful and stuffy. *On a diplomatic visit to a neighboring pack, she met and fell in love with a nobleman (the "Prince") of another pack whom also shared her views of feeling restricted by his pack's rules and they developed a forbidden romance even though Karria was promised to be mated to another noble from a 'friendlier' (read: richer) pack. The two met in secret for many months, nearly a year, in which time, Karria was taught the basics of falconry by her lover and gifted her own bird, before the two were discovered. *The two eloped one night after both sides' parents disapproved and forbid their mateship. Commanding one of his pack's ships to seek a life free of the rules and restrictions they'd grown up in the two sought to travel across seas to rumored free lands there. Each of them took one loyal servant along. *Eventually they reached 'Souls, a bit worse for wear but hopeful for a new life, seeking to join one of the packs there in the strange new lands. They quickly are drawn to CdC as it's similar to what they were raised into and is the first, closet pack to their landing site. *They offer their myriad of skills and the ship to CdC as gestures of peace and loyalty. Today they are settling in to pack life, building their new lives as members of CdC.